Jayden Short knows there is no room for complacency as he attempts to cement his spot in a Tigers’ line-up looking to go back to back. Last season, the 22-year-old defender played the first 16 games but lost form at the wrong time and was out of the side as Richmond charged to their first premiership for 37 years. 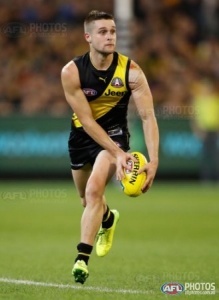 Short has not missed a game this season and was among the Tigers’ best in the Dreamtime at the ‘G, helping set up the win with eight touches off half-back in a blistering opening term. Not only does Short defend well but he has great balance on both sides of his body and a good leap that makes him play taller than his 178 centimetres might suggest. And he shows no signs of disappointment at being on the fringe at the end of last season, bouncing back hard. “I am loving my footy and they’re just a great bunch of blokes to play with. We all love each other and it is awesome to be around,” Short told Fairfax Media. Hardwick conceded that Short was one of the unlucky tales of last season, named as an emergency for the grand final, but he has not put a foot wrong this year and the coach thinks Short is one of the most-improved players in the competition. “The hard thing about our game is he [Short] plays 16 games last year and Jack Graham plays five. Jack Graham gets a medal, Jayden Short doesn’t. Ask me which one I value more, I value them the same,” Hardwick said. Short understands he has areas to work on as he pushes towards 50 games so he doesn’t have time to put his head up and look into the distance. “I don’t put too much pressure on myself. I’m just backing myself and playing to my strengths. I want to play AFL football so I want to stay in the team. I will try to do the best I can to stay in the team,” Short said. That battle for spots is only going to intensify as the finals close in with five players who did not play in last year’s flag in the team against Essendon last weekend. Bachar Houli, Dion Prestia, Daniel Rioli, Jacob Townsend and Jason Castagna are all prospects to return when ready. If that selection pressure isn’t enough to keep the players grounded, Hardwick says their love of winning is so strong he doesn’t have to work too hard to keep the team on track. “They’re very humble and they’re very hungry,” Hardwick said.